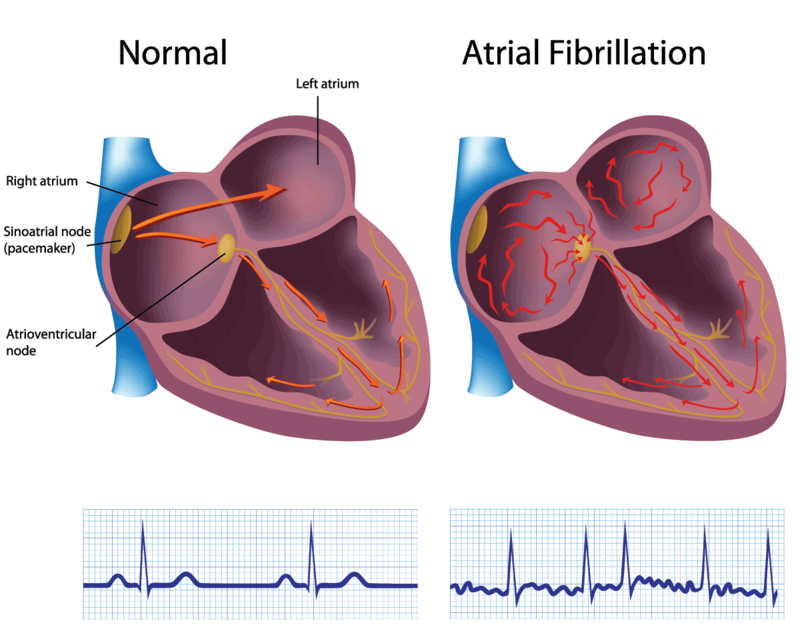 According to the American Heart Association, Afib or Atrial Fibrillation is the most common serious abnormality of a heart rhythm in people over the age of 65. Unfortunately, many patients are unaware that if this condition is left untreated, their chance of a heart-related death is doubled and their risk for strokes is increased by 4 to 5 times. Recent studies show that an estimated 2.7 million Americans are living with this condition. Well, Afib affects the heartbeat, making it irregular or quiver. This is called an arrhythmia. Certain cells in the heart make electrical signals controlling the pumping action of the heart. With each heartbeat the heart pumps blood into and out of its chambers and then to the rest of the body. Atria are the two upper chambers of the heart that contract to receive the blood and the ventricles are the two lower chambers that contract to send the blood throughout the body. With Afib blood doesn’t pump effectively from the atria to the ventricles as the atria quiver. This causes the blood to pool and increases the risk of blood clot. As this occurs, patients are at risk of blood clots, stroke, heart failure and other complications related to the heart. If a clot is formed due to pooling of blood and then breaks off, it can enter the bloodstream and lodge itself in an artery leading to the brain, thus causing a stroke. Approximately 15% to 20% of patients who have had strokes have this arrhythmia. Occasional: This is called paroxysmal Afib. Symptoms come and go and may last for a few minutes to hours, stopping on their own. Persistent: In this type of Afib, the heart is unable to restore its natural rhythm on its own. Treatment such as an electrical shock or medication therapy may be needed. Permanent: In this type of Afib, the heart is unable to be restored to its natural rhythm. This is a permanent condition and a patient will be prescribed medications for heart rate control and blood thinners may also be prescribed to prevent blood clot from forming. Sick sinus syndrome, the heart natural pacemaker is working improperly. Afib may happen to anyone, but the following people are at higher risks of developing Afib. Athletes: Due to the fact that Afib can be triggered by a rapid heartbeat. Advanced age:As we age, the risk of Afib increases. Although Afib in children is rare, it does occur. Pre-existing or underlying heart disease. Alcohol consumption – meaning binge drinking. A family history of related heart diseases. Chronic medical conditions,such as diabetes, thyroid problems, asthma, etc. Medications to control heart rate: Anti-arrhythmic medications are prescribed in hopes of restoring normal sinus rhythm. These may be given intravenously or orally depending on a patient’s heart condition. Patients are closely monitored during this phase and most of the time patient should continue to take this medication even if the natural rhythm has restored. Blood clot prevention: Patients with Afib are at a greater risk for developing blood clots, especially if a patient has another form of heart disease. Use blood thinners such as Coumadin are necessary to prevent blood clots, strokes and other heart diseases. Electrical cardioversion:During the process, the electrical activity of the heart is very briefly stopped as a result of an electrical shock. The goal is that when the heart begins to beat again, it will be in a normal sinus rhythm. Various anti-arrhythmic medications may be prescribed if the cardioversion succeeds in maintaining its normal rhythm. Ablation:If cardioversions fail, a physician may insert a catheter in the groin to guide him/her to the areas of atria that are firing erratically. Extreme cold or heat is used to destroy these hot spots to aid the heart in restoring its natural sinus rhythm. This method can treat the arrhythmia without prescription medications or implantable devices. Atrioventricular node ablation: It is used when all other methods of treatment are unsuccessful. During this procedure the pathway connecting the upper chambers and the lower chambers of the heart is destroyed using radiofrequency energy through a catheter. A pacemaker is then implanted to maintain proper beating of the ventricles. Long-term therapy with blood thinning medications is necessary to reduce the risk of stroke as the atria continue to fibrillate. Surgical maze procedure: During an open-heart surgery, doctors use a scalpel to create incisions in the atria to create a pattern of scar tissue. The electrical impulses that created the Afib are destroyed as scar tissue is unable to carry electricity. As this procedure requires open-heart surgery, it is reserved for people who do not respond to other treatments or is completed on patients who are already having heart surgery.